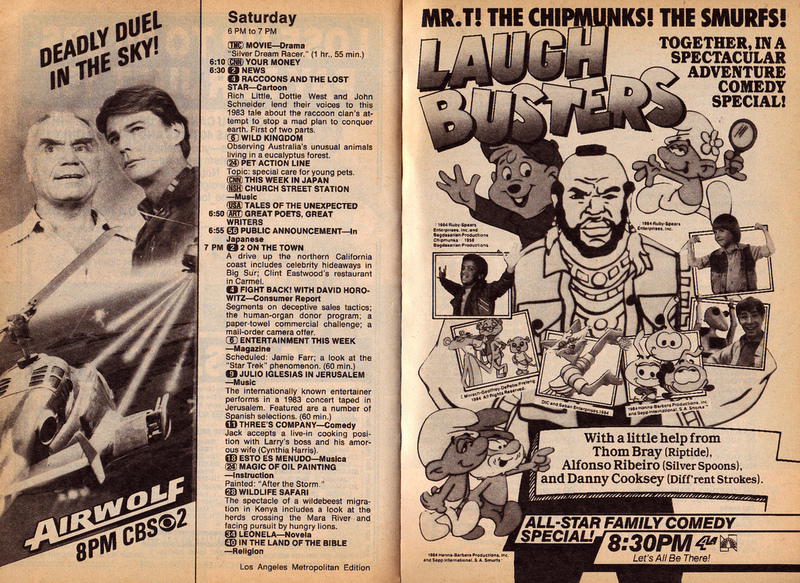 One of the many things I recall getting excited about as a kid was the annual run of prime time Saturday morning preview specials on each of the major television networks. Just before the new line-up of Saturday morning shows would hit the air, the networks would show 30-60 minute prime time specials featuring celebrities of the day and previewing the shows that kids would soon be spacing out to on Saturday mornings. The "director" of the special, D.W., opens the show only to find that the evil Gargomore has "Smurf-napped the Smurfs" in an attempt to wipe out anything humorous on NBC's Saturday morning. As Gargomore recruits Hank and Hubert from Going Bananas to prevent the Saturday morning stars from reaching NBC studios, D.W. seeks out the help of Riptide's Boz (Thom Bray) to foil their plan. Boz uses his robot companion, Roboz, to place a call to Spiderman but cannot get through as Spiderman has been "stuck" by Hank and Hubert. Meanwhile, Silver Spoons' Alfonso Ribiero and Roxanna Banana from Going Bananas are watching a musical performance by Diff'rent Strokes' Danny Cooksey. As he finishes, Danny takes a call from Boz who asks him to "drive to the outskirts of town to save Spiderman." Too young to drive, the only logical solution for getting him there is to contract the services of Knight Rider's KITT. A quick rescue frees Spiderman from his sticky situation. The efforts of Hank and Hubert continue as they attempt to wipe out the gang from Kidd Video by wrecking the Kiddmobile. As repairs are made, the band rehearses the theme song from their new show. Meanwhile, Roxanna Banana and Jamie Cole are traveling by bus (Roxanna driving, of course) as they look forward to their own new show, Going Bananas. Luckily, they come upon Kidd Video and offer them a ride. An APB is put out on Alvin and the Chipmunks as they have their train tickets and NBC passes stolen by Hank and Hubert. Thanks to Boz, the Chimpunks are picked up by the Screaming Mimi (the helicoptor from Riptide) and taken to Burbank. 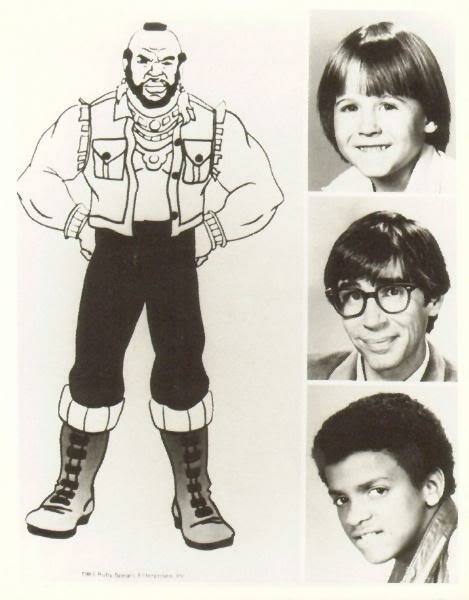 Mr. T and his crew of gymnasts fall victim to Gargamore's plan by following an invitation for a bogus gymnastics meet. They realize they've been had just in time to find that Hank and Hubert are attempting to steal their bus. Meanwhile, Pinky and Panky, from Pink Panther and Sons, avoid the hands of Hank and Hubert. With only a few chances left to prevent laughter on Saturday mornings, Hank and Hubert program a guided missile to wipe out the Snorks. Unfortunately for Hank and Hubert, the Snorks are able to counteract their mediocre efforts. Lastly, the Smufs (all but Papa Smurf and Smurfette) must be freed from Gargamore's castle. To save the others, Papa Smurf uses laughter (or light?) to weaken Garamore and free the Smurfs. The special can finally begin as everyone has made it to Burbank safely. Hank and Hubert realize that they cannot win and, as NBC Saturday morning stars themselves, they join the party. Although I have yet to come up with a video copy of Laugh Busters, an audio copy is a different story. Armed with a cassette recorder, my brother and I spent many hours taping various things including television commercials and specials. Thankfully, we chose to record Laugh Busters and the tape has survived the past 25+ years. If you're like me and have been searching high and low for a copy of Laugh Busters, part of me wonders if the description above, based on a rough audio recording, might be your best bet. If nothing else, maybe it can serve as a consolation until a video surfaces someday. Interested in hearing a crappy audio copy of this special? Drop me a line. 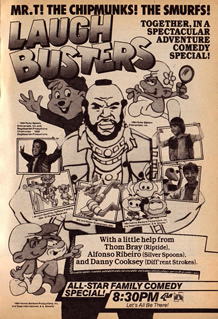 TV Guide scan courtesy of Branded in the 80's. Promo card image courtesy of eBay. I'm pretty sure things don't get much more awesome than this. I'm an idiot when it comes to obscure details from movies that I like. I take notice of the most ridiculous things. 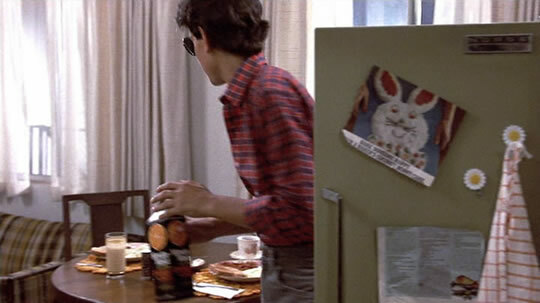 For example, have you ever noticed the picture of a bunny-shaped cake that hangs on the refrigerator door in the LaRusso's apartment in the original Karate Kid? Speaking of these minor (but semi-interesting) details, after looking at the finer points of Ferris Bueller's bedroom a few months ago, I was very happy to find that someone else out there has a similar obsession. An article by Larry Granillo surfaced today on BaseballProspectus.com which focuses on the scene in Ferris Bueller's Day Off where Ferris and his pals visit Wrigley Field. Granillo has done the research and determined the exact game on Chicago's North Side that was captured on film in movie. Do you even need to wonder how awesome this is? If you're not sure, the answer is "very." I won't spoil the outcome -- you can read the article for yourself -- but thank you, Mr. Granillo. You are my hero today. I don't remember who won. In fact, I had to look online to find out who even played that year. What I do know is that the roads were icy as my mom and I came home from a Super Bowl party at church. Hitting a slick spot on a back road, our GMC Jimmy wound up stuck in the ditch. 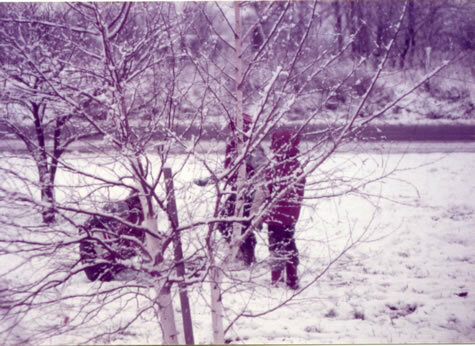 As anyone living in a small town would do, we walked to the closest house where the family of one of my classmates lived and my mom called a family friend with a tractor and chain. We were out and headed home within the half-hour. Disappointment. Being a huge Chicago Cubs fan, I know the meaning of this word better than most other sports fans. 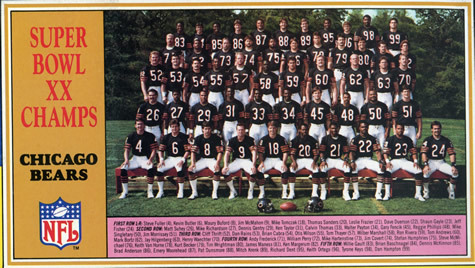 With limited success from the Cubs in my lifetime, I was excited when my favorite football team made it to the big game. I wasn't surprised when they lost to the superior Patriots and went home as football's #2 team. The one thing in sports that I like just as much as seeing my team succeed is watching the failure of a team I hate. Super Bowl XLII was a perfect example of this. The Patriots entered the Super Bowl with a perfect record through the entire season and playoffs up to that point only to be shocked by Eli Manning and the Giants. Sweet. First off, let me say that I'm not a Bears fan. In fact, I've come to dislike the Bears more and more each year that I watch football. 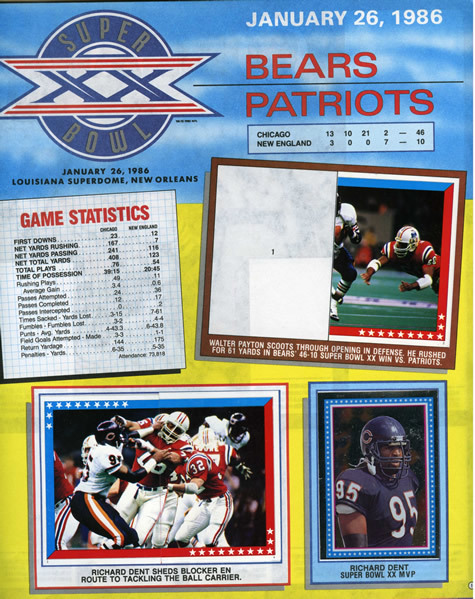 But back in 1986 when I was ten, all I knew was that the team from my home state was the Super Bowl favorite. Every kid wanted to be as fast as Walter Payton and as cool as Jim McMahon. 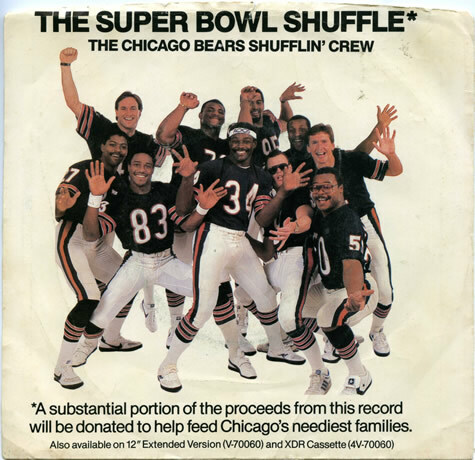 There was no question that at the possible opportunity, I would pick up a copy of the Super Bowl Shuffle. I knew (and, of course, still know) all of the words and spent my share of time lip syncing the song in front of my bedroom mirror. Sometimes I was Sweetness (because I like to dance) and other times I was the Punky QB (because I ain't got no plan). 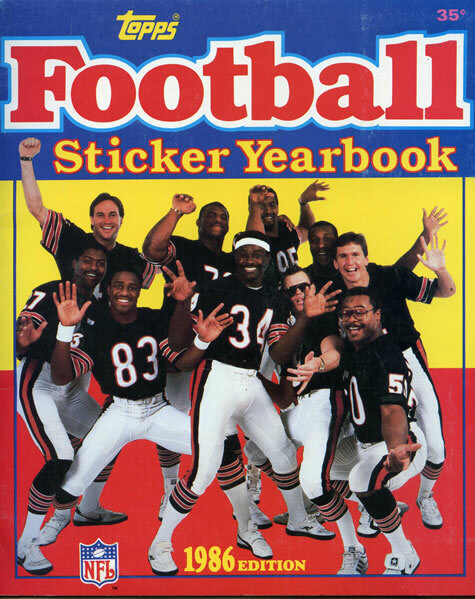 Having collected baseball cards for five or six years by this time, I also picked up the the Topps Football Sticker Yearbook for 1986. I'd like to think it was because I was taking more of an interest in football to balance out my baseball obsession -- but really I bought it simply because it looked like the cover of my Super Bowl Shuffle record. ...while the first page inside features some basics about the game. As you can tell from the missing sticker, my dedication to this album was pretty minimal. 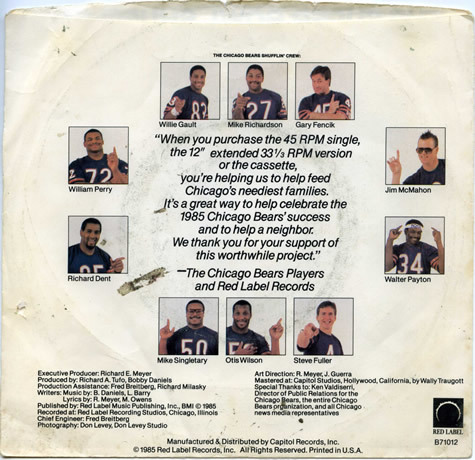 ...and for those of you who remember the hype surrounding the Super Bowl Shuffle, maybe you even had the record or tape yourself, the Onion wrote an article a few years back that you'll certainly appreciate...'85 Chicago Bears Return To Studio. 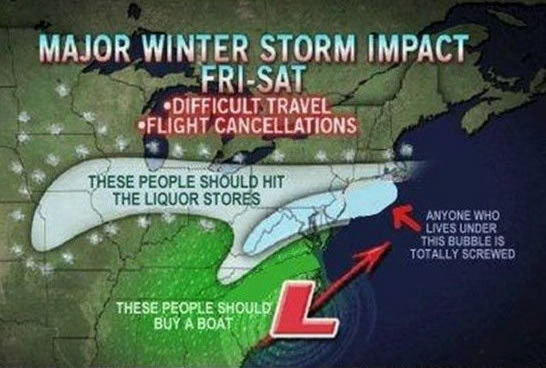 Super Bowl XLV is knocking at our doors and I know everyone would love to have an edge when it comes to the office pool. Here you have it. Three of the most reliable sources of Super Bowl information that you'll find anywhere online. About a week and a half ago, I had the idea to find out the outcome of Super Bowl XLV by way of Nintendo's Super Tecmo Bowl. Then I watched Tosh.0 a few nights ago and was surprised to find that Daniel Tosh ended his show by stealing my idea. Either way, according to this 1991 classic, the Steelers will take a 3-0 lead into halftime after a late 2nd quarter field goal. From there, the Packers will resond with a 3rd quarter touchdown and a late field goal to end the game as 10-3 Super Bowl champs. Did you have this game as a kid? I did. If so, did you ever play it? Me either. I got this out of the clearance aisle at Wal-Mart sometime back in the mid/late 80's for eight bucks. If you're unfamiliar with Electric Football, the idea is simple. You set up the plastic players in their offensive and defensive formations, flip the power switch, and try to pay attention to what happens as the metal playing field shatters your ear drums with its obnoxious buzzing as it vibrates the players through the play. That's 1st down. Then you repeat it....over and over. This game might be fun for about 30 seconds, but how is it when it comes to Super Bowl predictions? After one play, I have to think that the Super Bowl will end in a tie. As you can see below, the players will come out confused from the opening play of the game. In that one play alone, we have players from the same team struggling against one another and others aimlessly wandering around the end zone. Meanwhile, the quarterback has not moved an inch. I tried to get a score out of her as well but she was more interested in Dora than football.